Bolaji is the President of Dynamic Civil Solutions, a civil and transportation engineering firm headquartered in Birmingham, Alabama. 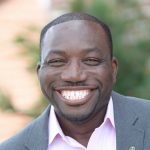 Bolaji received multiple degrees from the University of Alabama at Birmingham: a Bachelor of Science in Civil Engineering, a Bachelor of Science in Mathematics and a Master of Science in Mathematics. As a licensed professional in multiple states, Bolaji possesses extensive experience on many civil site, roadway and transportation projects. He is adept in the development of civil and transportation construction plans having worked with sundry agencies and has successfully managed multi-million dollar programs with portfolios in excess of $70 million. Bolaji was the first dual recipient of the UAB Excellence in Business Top 25 and has also served as a panelist for the National Science Foundation Academic Research Infrastructure Program, a program designed to support 21st century research and research training infrastructure in our Nation’s academic institutions and non-profit research organizations.